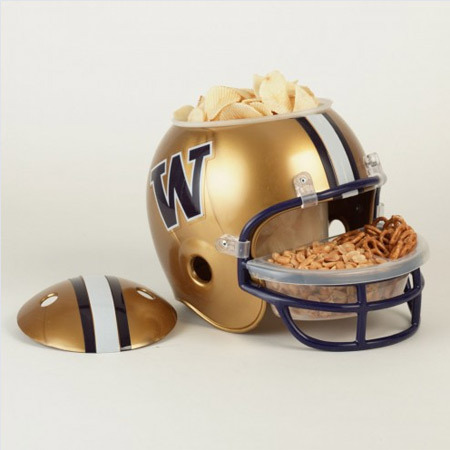 Sure to be the hit of the UW tailgate party, this NCAA University of Washington Huskies Snack Helmet is so fun! The large container inside the helmet is perfect for chips or popcorn and the smaller two-tray compartment in the facemask is great for pretzels, nuts, dips and candy. We include Tim’s Cascade Potato Chips, Seattle Sinsations Pretzels and Outrageous Offerings Chipotle Cashews. Sure to be a hit with any Washington Huskies fan, student or alumni.